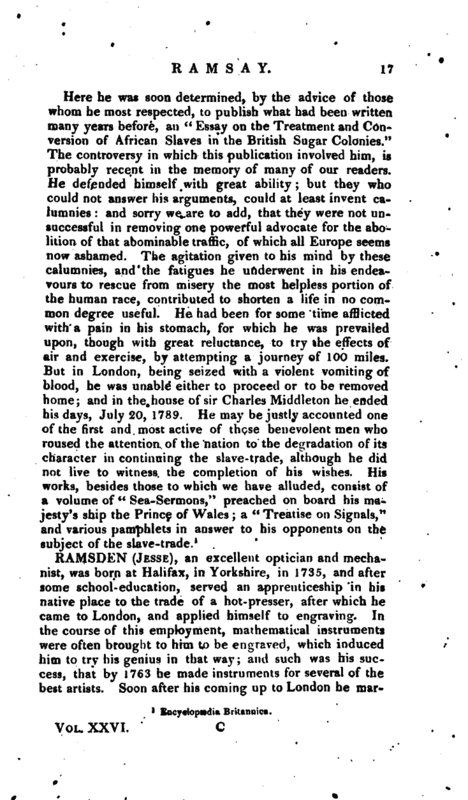 , an excellent optician and mechanist, was born at Halifax, in Yorkshire, in 1735, and after some school-education, served an apprenticeship in his native place to the trade of a hot-presser, after which he came to London, and applied himself to engraving. In the course of this employment, mathematical instruments were often brought to him to be engraved, which induced him to try his genius in that way; and such was his success, that by 1763 he made instruments for several of the best artists. Soon after his coming up to London he | married the daughter of Mr. Dollond, the celebrated optician of St. Paul’s church-yard; by which means he was introduced to the knowledge of a profession in which his genius enabled him to excel), and attract the approbation of the public, in the same manner as his private worth endeared him to society. In 1763 or 1764 he opened a shop in the Hay-market; but in 1775 he removed to Piccadilly, where he carried on business till his death. 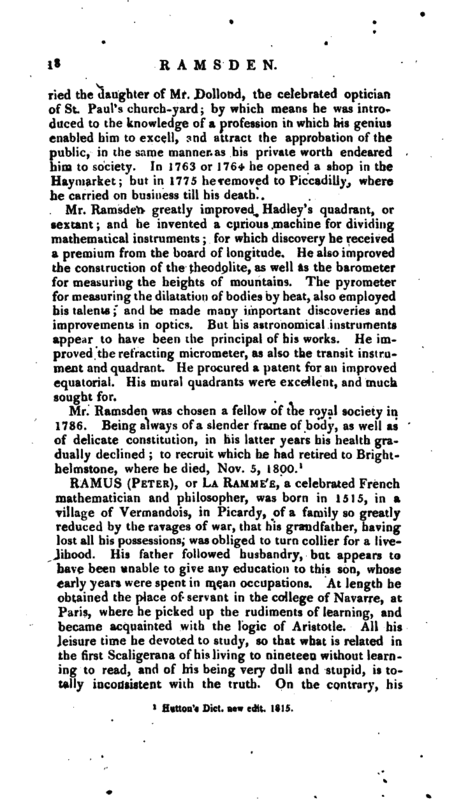 Mr. Ramsden greatly improved Hadiey’s quadrant, or sextant; and he invented a curious machine for dividing mathematical instruments; for which discovery he received a premium from the board of longitude. He also improved the construction of the theodolite, as well as the barometer for measuring the heights of mountains. The pyrometer for measuring the dilatation of bodies oy heat, also employed his talents; and he made many important discoveries and improvements in optics. But his astronomical instruments appear to have been the principal of his works. He improved the refracting micrometer, as also the transit instrument and quadrant. He procured a patent for an improved equatorial. His mural quadrants were excellent, and much sought for. 1 Hutton’s Dict. new edit. 1815.